I can’t believe that I finally ended up in New York! Time flew by soooo fast and by the end of the 5 weeks, I felt like I had just scratched the surface of a city overflowing with music, art, diversity, dreams, life, and a culture all of its own. The city is literally a concrete jungle. I loved being able to leave my apartment without any plans–only ambition–and just wander and be completely amused by everything I came across. I have never run into so many hidden gems: bookstores, open art studios, boutiques, a store dedicated to lomography..the list goes on. 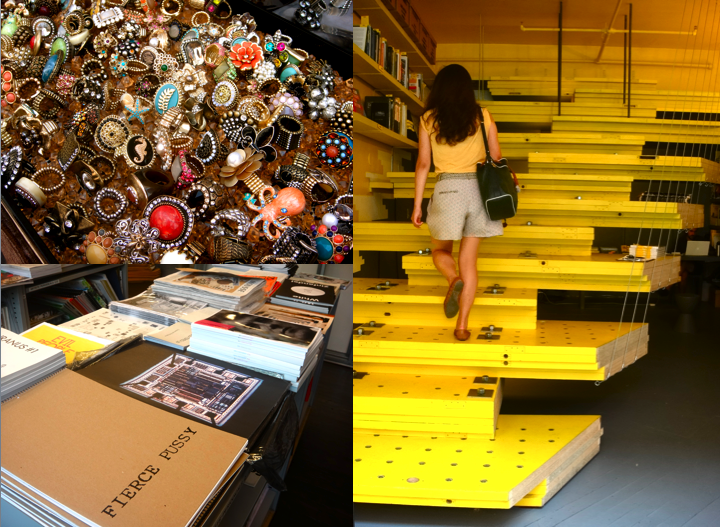 Below (clockwise from left): a beautiful cluster of rings at an open market that we ran across, Van Alen bookstore which had a great selection of architecture & design books (very fitting architectural installation of yellow stairs), and Printed Matter (one of my most favorite spots in NYC). I learned so much from enrolling in Parsons The New School. 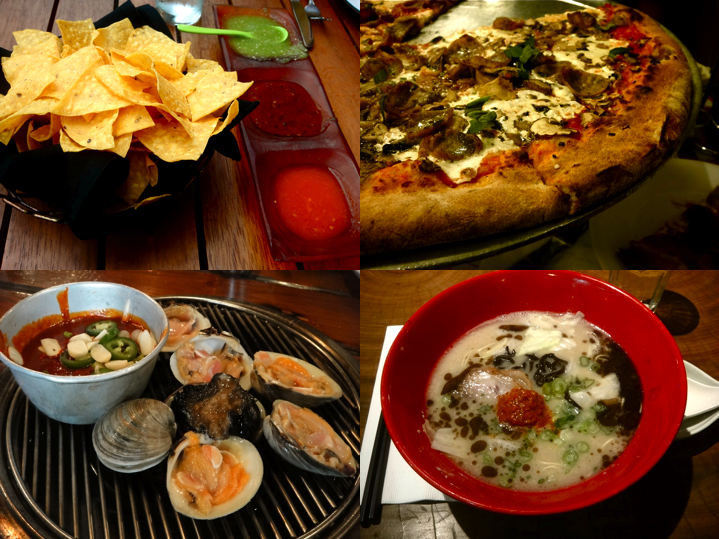 At first I felt so…American?? I was one of the only 4 U.S. citizens in our class. There were students from all over the world: Taiwan, Norway, India, Mexico, England, Australia, Canada… It was so exciting to work with a group of such talented people with amazingly diverse styles and ideas. We had five big projects. The first was creating three spreads for a collaborated book. We were assigned to basic elements of design (mine was “space”) and had to create the spreads by incorporating elements of ourselves and NYC. 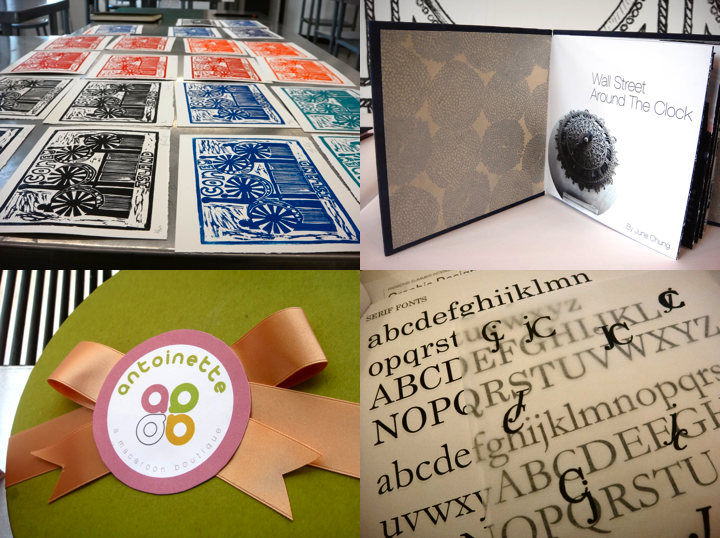 We also did bookbinding (mine was based on Wall Street), created posters based on Surrealism using photo montage, made postcards by lino cutting and stamping our impressions of Coney Island, and finally, created an entire brand around a fictional business (I decided on a macaroon boutique dubbed “Antoinette”). It was a busy 4 weeks! But what made my NYC experience so great was definitely the people. I met up with those whom I hadn’t seen in months and even years!! And it was soo good catching up. 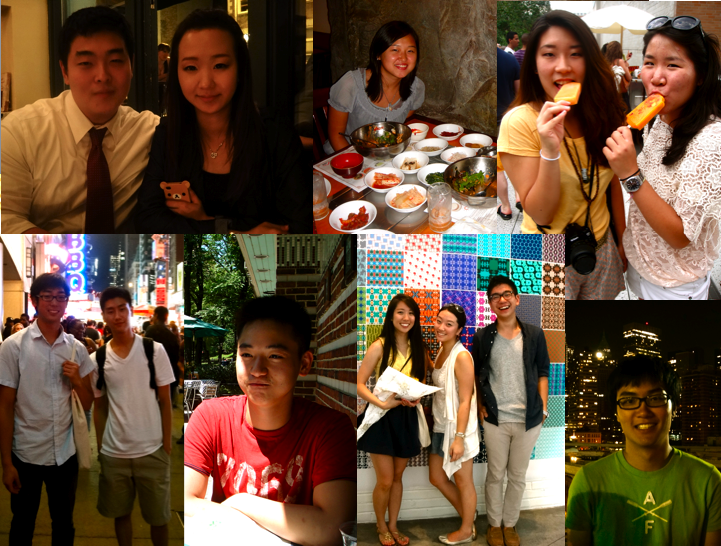 Friends from Northeastern, Seoul National University/Korea 2009, Chicago/home, and even childhood friends from Maple Middle School, were all drawn to the city–whether it was to start fresh, to visit, or settle for a few years. 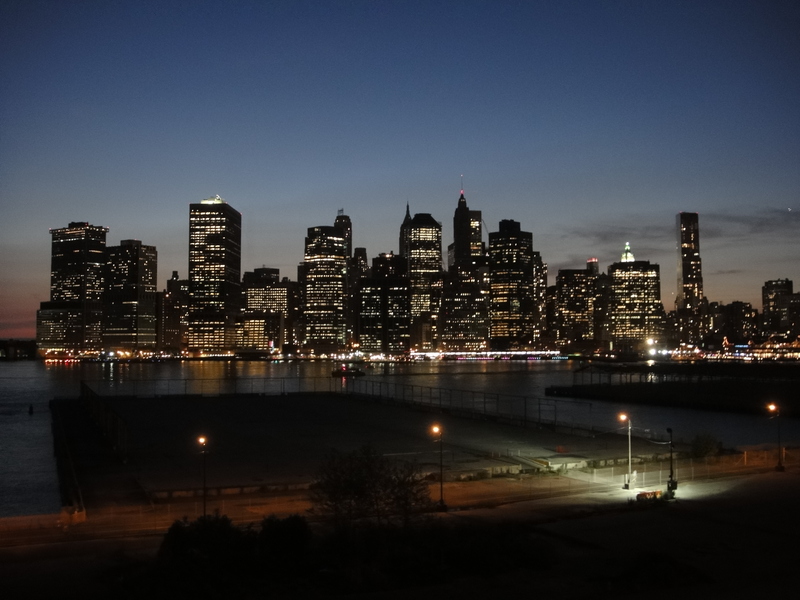 It seems as though we are all dreamers and New York attracts us like a magnet. 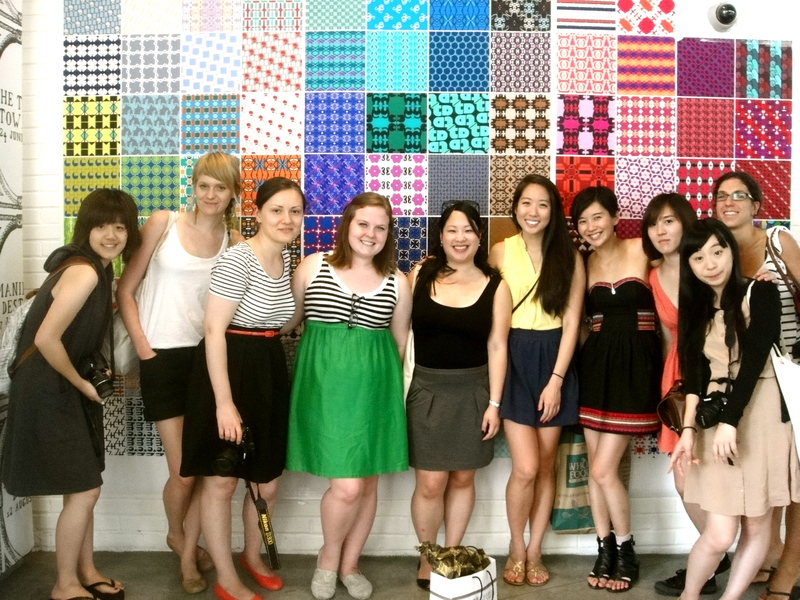 Oh June, it looks like you had the most wonderful experience at Parsons!!! 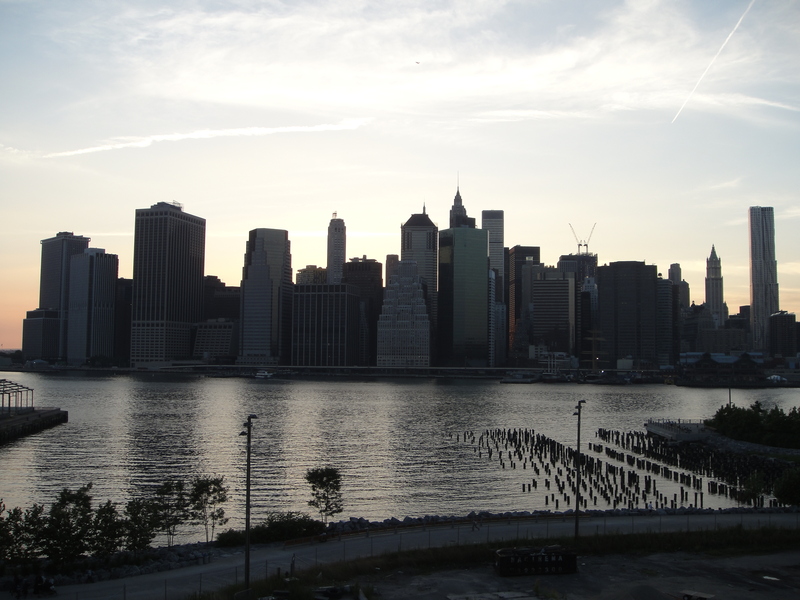 I love the picture of the yellow stairs and the morning and night New York Skyline. I can’t wait to see all your projects in person one day!